So...on my green 76 Laguna, I had the R12 recharged last year after putting a new reman compressor on it. Worked fine all year but then the front seal on the compressor started slowly leaking, and over the course of the year it eventually leaked enough out to stop the compressor from working so I just unplugged it. I have cases of all kinds of 134a sitting in my garage so I figured I'd convert it and put some stop leak in it to see if that works. Plus I don't feel like paying for the R12 whenever I have to charge it in the long run. Anyways, I was looking up the receiver drier at my work to see about replacing it along with the orifice tube filter before I vaccum the R12 out and take compressor off to dump old oil out and put new oil for 134 in it. And the only receiver drier they sell looks like some kind of universal one with 3 different pre bent hoses. And it looks very different from the factory setup. Has anyone ever installed one of these or know how difficult it is? My other question is...I can just buy the desiccant bag and seals without the whole universal assembly, but are you able to take the the original assembly apart on these cars to replace just the bag? This is my first time looking at converting an ac system but any help is much appreciated. I installed an aftermarket receiver/dryer from Amazon. It wasn't too difficult to replace. I don't know how good it works since I haven't hooked up the A/C yet but I hope to next weekend. I ordered the orifice tube as well but I haven't installed that yet. I have done at least a dozen 12 to 134a conversions over the years. You will need to clean/blow out your existing lines to remove residual oils. Same with your condensor. A new orifice tube and dryer are a must with any conversion. My car didnt come with A/C but didnt our years have some sort of POV (or something) kind of valve instead of an orifice tube? As for orifice tubes, I've had great luck with the Smart VOV orifice tube. It basically is a spring loaded orifice tube that can slightly open and close depending upon high line pressure. The benefit to it is that it compensates for either idling in traffic or moving along. You get better cooling at lower pressures. Dont know if it applies on our cars but it has worked good for me. Do you have a "VIR" type of receiver or the modern silver canister type? VIR (Valves In Receiver) type you have to open and replace the bag of desiccant. Silver canister type the whole thing gets replaced, should still be readily available. Maybe put up some pics or google it see. I re-sealed my original A6 style compressor (the long heavy one), Got a GM seal kit for it. Several good you tube vids that will show you how to do it. Works like a charm and no leaks. This was after a dis-appointing parts store re-man junk one failed. I used both the VIR Eliminator kit on my 76 El Camino and then upgraded my 75 Laguna to the 77 A/C system that utilized the orifice tube system. These are both a step up for the old VIR system and the also work better when converting to a different refrigerant. 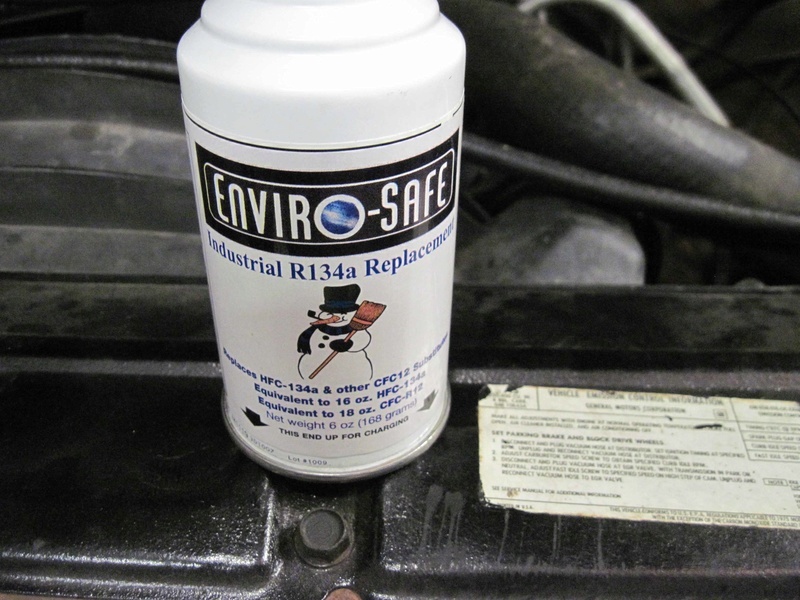 I've been using Enviro-Safe refrigerant for over 25 years after R-12 was banned from being sold to the general public. This is a direct replacement for R-12 which is compatible with all refrigerant oils and is not reactive to moisture like most other refrigerants which causes corrosion and ultimately a/c system failure. I have yet to have a compressor fail since using Enviro-Safe and it performs better than R-12 and far better than R-134a while utilizing half the amount of refrigerant in your a/c system. The burgundy 75 Laguna I sold last year was charged with this refrigerant and ran at 40 degrees at idle. Below is a link to the video showing the temperature as well as a can I purchased on ebay for about $6 a can. So many good options here it sounds like. Thanks for all the feedback. I do have the original VIR style setup. And I can order the replacement bag and seals through my work for under $20. I'll try to post pics later. But seeing how I'm trying to do this on a budget I'll probably go the way of just replacing the bag and blow the lines out, etc....and see if that'll do it. But I'm not sure if I even have an orifice tube or not? My work also sells an evaporator repair kit that comes with an orifice tube inside a tube with what looks like a compression fitting on one end. Looks like you're supposed to splice it into your existing line right before it goes into the evaporator. Should I install one of these too? If you are running a VIR system it would be pointless and possibly counter-productive to add an orifice tube since both basically do the same thing. The orifice tube setup is much more reliable than the old VIR systems and much less expensive to repair. The average cost for an orifice tube is $5-$10 where the VIR can cost as much as $200 to replace. The VIR rebuild kits are inexpensive but typically only come with seals and a desiccant bag which can't fix a sticking valve. The VIR eliminator kits, which incorporates an orifice tube, run around $100 and are easy to install. It does away with the entire VIR system which can be temperamental especially when converting refrigerants and oils. Oh ok, I gotcha. I don't usually mess with a/c systems so most of this is new to me and I'm learning as I go. But this helps a lot. Sounds like that's the way to go. I'm gonna start making a parts list and disassembling the VIR soon so I'll let you know how the progress goes and post some pics. Thanks again! Best of luck. Let me know if I can help with anything if you get stuck on your project. One more question...After you take the compressor off and get all the old oil out, what kind of oil and how much do you put into the compressor to run with the 134A? I would highly recommend against using R-134a in any of these old R-12 systems. The chemical makeup of R-134a is significantly different from R-12 and requires a newer technology barrier hose to keep it from seeping out of the rubber hoses. It also requires more refrigerant in our systems than they were designed to handle. Your best bet is to keep your mineral oil base in your system and use Enviro-Safe refrigerant which requires only half the amount of what is recommended for R-12 and works just as good as R-12 if not better. As I mentioned in an earlier post I've been using this refrigerant for over 25 years with no compressor failures. Enviro-Safe is not affected by moisture as R-12 or R-134a is and that's what destroys your A/C system. Or if you simply don't want to convert to this alternate refrigerant stick with R-12 and mineral oil if your wallet can afford it. Your sweat glands will be grateful. Hope this helps. I had not heard of the Enviro-safe stuff before. ( I don't get out much ! ) My '75 Elco has '77 AC parts in it except hoses, which I knew wouldn't work. And I tossed the A6 compressor. I'm gonna go with a Sanden type, but that Envior-safe stuff sounds like the way to go. I bought a can of cleaner fluid made to clean the lines etc. and blew them out with nitrogen ( no moisture like air). I'm a real dummy when it comes to AC stuff !! But, my '74 Malibu still has all the original stuff, so maybe the Enviro-safe stuff may work to to re-charge it ?? Thanks for all your info ! When they first came out with this alternate refrigerant, they called it ES-12a. They claimed it was "compatible" and mixed with R-12 and R-134a refrigerants. I never attempted mixing with R-12 as I always evacuated the system completely before servicing it. You can contact them directly and see what they say about mixing. Also, I opted to to forego upgrading to a sanden compressor since this requires aftermarket brackets and hoses. Instead I chose a "ProTen" style compressor which is a direct bolt in replacement for the original A-6 style compressor. So no special brackets or hoses required. It weighs about a third of what the original compressors weigh and are much more efficient and require less horsepower to operate. Below is a link to the one I installed on my 75 Laguna last summer. Still blows ice cold which is much appreciated in Houston where the summer temps are always in the mid to upper 90's as well as the humidity lol. g3 - you talked me into the enviro-safe, lol. I will hopefully be able to try it out next weekend. Well I just ordered 1 can. 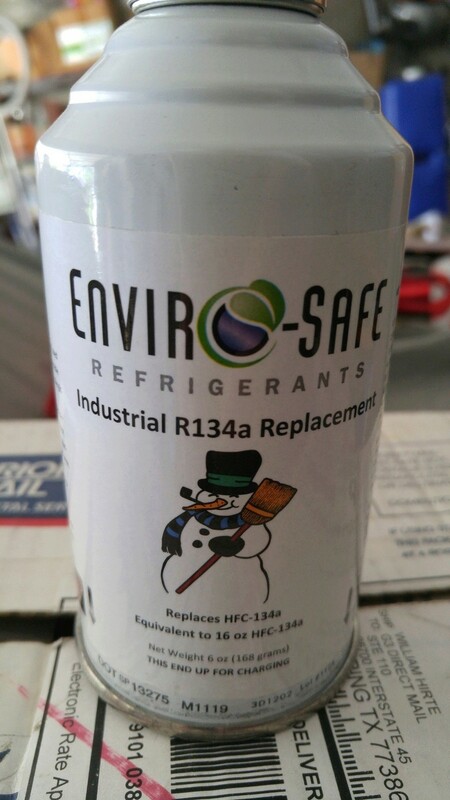 It just took me a while to figure it out because on their website and on the can it just says R134a refrigerant and says nothing about being compatible with both 134a AND r12. I had to read the customer reviews on Amazon to see that a lot of people used it on their old r12 systems. Since my AC system was working fine before, except the slow leak out the front compressor seal, I guess I'll just try adding a little of this and see if it works. Should be here next Wednesday. It was only 7 bucks for a 6 oz. can (equivalent to 16 oz HFC-134a) so I don't have much to lose by trying it out. Better than 25 bucks a can or more for r12. Just make sure when you install it, that the can is inverted as per the instructions. Also, the cans are setup to work with R-134a gauge sets so you'll need to install adapter fittings on the low and high side valves for proper charging. I forgot to mention they sell an "industrial" version which works better than the original blend which is what I've been using the past couple of years. It typically runs about 10 degrees cooler depending on the ambient temperature outside. awesome. Yeah, I have a bunch of adapter fittings at home along with a set of the charging gauges. I'm anxious to try it out and see what happens. I guess if I can't get the system back up and working with this alone, which there's really no reason it shouldn't, I'll start looking at the VIR eliminator kit and start piecing all that together. Btw there were a few guys who wrote up reviews on this stuff and said they used it to top off their r12 system and hasn't caused any issues, so I have to assume it's safe to mix. But I did leave a message for the enviro-safe people to call me back just to confirm. So I got 4 cans of enviro-safe refrigerant a few weeks ago and added 2 cans to my empty system after my r12 leaked out. I've been driving it pretty regularly since then and it's been blowing not quite cold but cool enough to know it's working. Which is a huge relief. My question now is how much will the system hold? I know if you convert to 134a the system uses less so I'm not sure about this stuff. I don't want to just go off of what the r12 label says and end up overcharging it. Your system when completely empty will hold 3 cans of Enviro-Safe refrigerant. That should get you the temperatures you're looking for. Thank you so much for all the feedback! Perfect timing too. The temps this weekend here in Omaha are in the 90's and humid and I planned on getting the car out for a bit to test out the a/c. Well it's been a week since I fully charged my A/C system with 3 cans of the enviro-safe stuff and it's been blowing close to ice cold! The wife and I went for a drive on Tuesday when the temp was in the mid 80's and she asked me to turn it down because it was too cold. lol love it. That stuff really is a good deal. In addition, I remember how much the engine would bog down when I turned the ac on before with straight R12. And this stuff doesn't seem to put nearly the amount of drag on the engine. Still just a little noticeable but not nearly as bad. Just saved me a bunch of $ and time from not having to convert to 134A. I was very skeptical the first time I ordered this stuff over 25 years ago. I am certified to purchase R-12 but the cost got out of hand. Also heard many stories of converting to R-134a that did not turn out well. So I took a chance and was very impressed when I installed it on my dads New Yorker as my first experiment. Been using it in all my g3's since then. So glad it worked out for your project. It just seems like the best alternative to R-12 since its efficient and does not harm the environment if it escapes from your a/c system. Enjoy your "cool" summer! In short, its all about the money. Dupont has owned the patent on almost all refrigerants in the U.S. since it was first manufactured. When their patents run out, they use their influence to persuade the government to approve a new type and then make it the industry standard. This is happening as we speak with commercial and residential a/c systems, most notably with R-22 being phased out for the new R-410A refrigerant for household units. So if your R-22 unit fails, you are forced to replace your entire system to be compliant with EPA standards. Also, because Dupont's influence, they were able to block the use of all alternatives to their refrigerants, including Enviro-Safe which is a non-toxic hydrocarbon refrigerant. Interestingly enough, hydrocarbon refrigerants are widely used in many parts of Europe and Australia. Maybe because Dupont has little influence in these parts of the world??? Regardless, you can do your own research and find many people like myself that are using hydrocarbon refrigerants with great success. Below is a link to a forum discussing the topic of patents on refrigerants. Very interesting read.